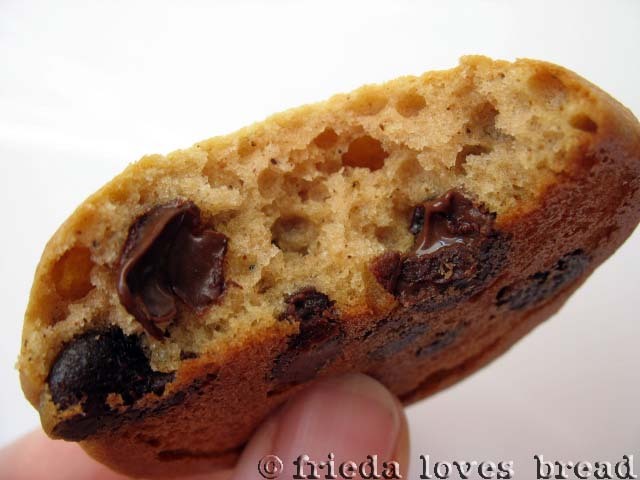 Take a good look at this Applesauce Chocolate Chip cookie. Now take a close look at this one. Notice any difference? 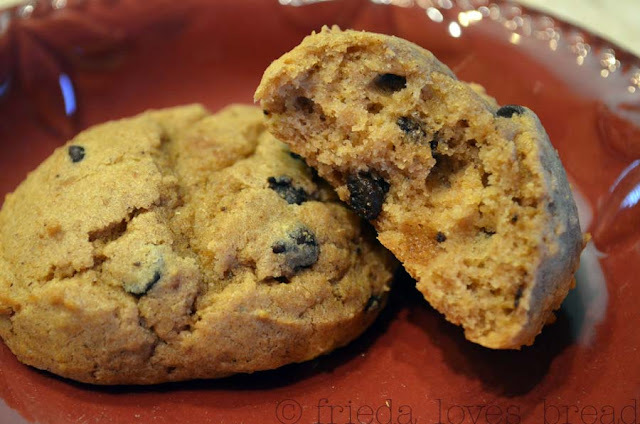 I used whole wheat flour in the first cookie. I didn't use just any wheat, I used SOFT white wheat, and when ground, it is known as whole wheat pastry flour. Sure, you can use regular hard wheat in your cookie recipes, but I wouldn't recommend it. Your cakes and cookies will be heavy, dense, and chewy. Hard wheat is okay in maybe an oatmeal cookie, but not for your tender cakes, muffins and cookies. For anything with YEAST, use HARD wheat. For anything with baking powder or baking soda, use SOFT wheat. Goods to try soft wheat in: cakes, muffins, cookies, flat breads, pastries, crackers, and noodles. This is a great way to incorporate healthy protein, fiber and grains into your diet ~ give it a try! Where do you purchase your soft white here in Utah? I always have trouble finding it. Bonnie, I purchased this wheat at Kitchen Kneads in West Jordan. You can try from several Emergency Essentials stores (http://tinyurl.com/7s7thyb) or from a few Good Earth stores (http://tinyurl.com/6wqkx4c). Good luck! 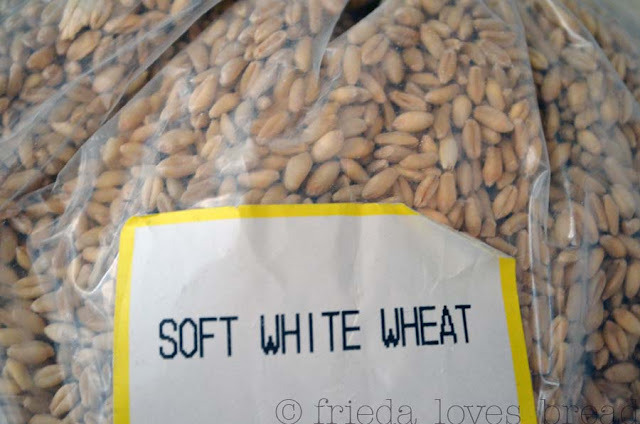 I've been using soft white wheat for about a year now and really love it in my muffins and baked goods! I never knew it was used for pastry flour. Thanks! I have used Chef Brad's WonderFlour a few times and it works great for a white flour replacement. Search for wonderflour and the instructions should be the first google result. It uses spelt grain, brown rice, and pearled barley ground into flour in your grain mill. All of these ingredients are good for you. I didn't learn this until recently - but you make products that are hard (like crackers and cookies) with soft wheat. And you make products that are soft (like bread and buns) with hard wheat. Seems backwards, huh? If that was true, then you would want to use hard wheat in cakes and muffins, but that goes opposite to what this article and conventional wisdom teach us. If you re-read the article, it clearly state that the rule is to use hard flour with yeast, and soft flour with baking powder/soda. This is also consistent with the examples you gave. Gluten content is the distinction between Hard and Soft wheat. Breads are better with more gluten, while cakes and other pastries are much softer/fluffier with low gluten flour, which is commonly sold as Pastry Flour or Cake Flour. Not all gluten is equal either. There is strong gluten and weak gluten, just to complicate matters. I agree. There is more gluten in bread flour than in wheat flour. I stumbled upon this blog after googling soft white wheat. I mill my own grain and have found that when I use soft white, my baked goods are soupy. I made pancakes this morning with soft white and I had to add a lot more than the recipe called for. When I make it with hard wheat, I don't have that problem. Any thoughts? It is surprising to me how much the weight varies in flour for baked goods! Also, the humidity in your area can be a determining factor. I live in Utah, which is a desert, so I don't add as much flour as the recipe may call for. If I were in a more humid climate, or if it is snowing/raining that day, I add more flour. I hope this answers your question ~ Happy Baking!